Apple season is one of our favorites (as if you hadn't already picked that up form my several posts about apples!) so it stands to reason that I'd make a lot of apple dishes. This week, I made apple crisp. Place apples in the bottom of dish. Sprinkle on top of apples and bake at 325 for 45 minutes, until topping is crisp and apples are soft when pierced. For this recipe, I used Winesap apples. I like them because they're slightly tart and stand up really well in baking. When we picked these apples, I wore my new Carhartt hoodie. Want to win one of your own? Check out Real Farmwives of America to find out how! Now, it's time to link up some of those great dishes you make from scratch! 1. You can link up as many posts as you'd like. 2. My only content rule is it has to be made from scratch. 3. The post you link up MUST CONTAIN A RECIPE! 4. If you want to put my button somewhere, that'd be cool. 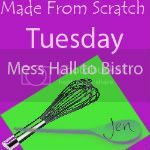 You can grab the code for the Made From Scratch Tuesday button on the top right of my sidebar. I shared my pecan crusted grouper! I shared Whole Wheat Banana Bread. Love your blog and now following. Please join us on Thursday's Treasures. <3 and Hugs! Hi There! This is my first time linking up, so I added 3 posts - hope that was okay! :) Thank you so much for hosting! Follow Jennifer's board My Recipes on Pinterest.